Arachnida - Spiders, Scorpions, etc. Maxillopoda - barnacles, fish lice, copepods, etc. Malacostraca - lobsters, crabs, shrimp, etc. Arthropods (phylum Arthropoda) are the largest phylum of animals and include the insects, arachnids, and crustaceans, as well as millipedes and centipedes, among others. Approximately 80 percent of extant (living) animal species are classified as arthropods, with over a million modern species described and a fossil record reaching back to the early Cambrian. Arthropods are invertebrates that are characterized by the possession of a segmented body, a pair of jointed appendages on each segment, and an exoskeleton. The jointed appendages, which include both legs and antennae, are the source for the name arthropod, which comes from the Greek word for jointed foot. In some species, appendages are not present, but are assumed to have been lost during the course of evolution. All arthropods are covered by a hard exoskeleton, made out of protein and a tough polysaccharide called chitin. The exoskeleton provides support and protection. Periodically, an arthropod sheds this covering when it molts. Arthropods also have a dorsal heart, a ventral nervous system, an open circulatory system, and a digestive system. Arthropods play a major role in human life as food, religious symbols, pollinators of flowers, and major links in food chains, as well as vectors of disease and agricultural pests. Arthropods are adapted to almost all environments on earth. They are common throughout marine, freshwater, terrestrial, and even aerial environments, as well as including various symbiotic and parasitic forms. They range in size from microscopic plankton (~0.25 mm) up to forms several meters long. The success of the arthropods is related to their hard exoskeleton, segmentation, and jointed appendages. The exoskeleton provides more support and better protection of internal organs than the covering of other invertebrates. The cuticle (noncellular protective covering) in arthropods forms a rigid exoskeleton, composed mainly of chitin, which is periodically shed as the animal grows. The exoskeleton's middle zone is made of both protein and chitin and is responsible for the strength of the exoskeleton. It may be additionally strengthened by minerals, such as calcium. The innermost zone is flexible at the joints allowing free movement. The outer zone is nonchitinous and is a complex of proteins and lipids. It provides moisture proofing and protection. The exoskeleton takes the form of plates called sclerites on the segments, plus rings on the appendages that divide them into segments separated by joints. This is what differentiates arthropods from their very close relatives, the Onychophora and Tardigrada. The skeletons of arthropods strengthen them against attack by predators and are impermeable to water, but in order to grow, an arthropod must shed its old exoskeleton and secrete a new one. This process, molting or ecdysis, is expensive in terms of energy consumption, and during the molting period, an arthropod is especially vulnerable. Not only does the lack of hard exoskeleton put it at greater risk of predators, but in the case of terrestrial arthropods, there is also a greater risk of desiccation. The appendages of arthropods are used for feeding, sensory reception, defense, and locomotion. Many crustaceans and insects can regenerate legs and antennas, as well as claws. The process of regeneration is associated with molting. Insects generally regenerate only during larval or young stages; metamorphosis to adults, which marks the end of molting, also marks the end of any regeneration of appendages. However, crustaceans generally molt and grow even as adults, and thus retain the ability to regenerate throughout life. Most arthropods respire through a tracheal system (exceptions are the centipede-like Pauropoda, some thysanurians, and some arachnids like many mites). This creates a potential difficulty considering that the skeletal structure is external and covers nearly all of the body. Aquatic arthropods use gills to exchange gases. These gills have an extensive surface area in contact with the surrounding water. Terrestrial arthropods have internal surfaces that are specialized for gas exchange. Insects have tracheal systems: air sacs leading into the body from pores, called spiracles, in the epidermis cuticle. Arthropods have an open circulatory system. Haemolymph, a copper-based blood analogue, is propelled by a series of hearts into the body cavity where it comes in direct contact with the tissues. Arthropods are protostomes. There is a coelom (body cavity), but it is reduced to a tiny cavity around the reproductive and excretory organs, and the dominant body cavity is a hemocoel, filled with hemolymph that bathes the organs directly. The arthropod body is divided into a series of distinct segments, plus a presegmental acron that usually supports compound and simple eyes and a postsegmental telson (the last body division in crustaceans, but not a true segment). These are grouped into distinct, specialized body regions called tagmata. Each segment at least primitively supports a pair of appendages. Trilobites are a group of formerly numerous marine animals that died in the mass extinction at the Permian-Triassic extinction event at the end of the Permian. Chelicerates include spiders, mites, scorpions, and related organisms. They are characterized by the absence of antennae and the presence of chelicerae (a pincer like mouthpart that has two components, a base segment and a fang portion). Myriapods comprise millipedes, centipedes, and their relatives, and have many body segments, each bearing one or two pairs of legs. They are sometimes grouped with the hexapods. Hexapods comprise insects and three small orders of insect-like animals with six thoracic legs. They are sometimes grouped with the myriapods, in a group called Uniramia. Crustaceans are primarily aquatic and Crustacea is the only subphylum of Arthropoda to contain mostly aquatic species. While most of these are marine, Crustacea also includes many freshwater forms and some terrestrial forms. 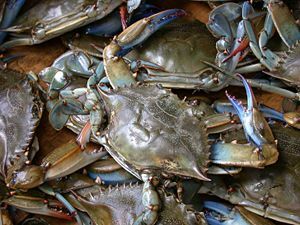 Crustaceans are characterized by having branched (biramous) appendages and chewing mouthparts (mandibles)—the later of which is shared with the Uniramia. They include lobsters, crabs, barnacles, and many others. Some classifications arrange the trilobites and chelicerates into the clade Arachnomorpha, and place members of other three groups into the clade Mandibulata, with the mandibulates characterized by biting mouthparts (mandibles). Aside from these major groups, there are also a number of fossil forms such as Cambropodus, Anomalocarida, and Euthycarcinoidea. These are mostly from the lower Cambrian and are difficult to classify, either from lack of obvious affinity to any of the main groups or from clear affinity to several of them. 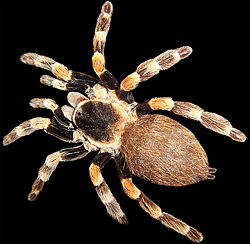 For humans, arthropods often evoke feelings of aversion, fear, repugnance, and anxiety. However, people derive a great deal of benefit from arthropods. Nutritionally, many arthropods are integral to the human diet, such as crabs, lobsters, and shrimp, and in some populations locusts, ants, termites, beetles, and grasshoppers, as well. Bees produce honey and pollination of flowering plants by bees is critical to the production of many agricultural products. Ecologically, arthropods play a central role in food chains, and arthropod plankton, such as copepods and krill, consume the photosynthetic phytoplankton and are eaten by larger carnivores, such as whales. Arthropods are involved in nutrient transfer, waste decomposition, and the control of weeds and other arthropods that may otherwise overrun ecosystems. Aesthetically, butterflies, beetles, and other arthropods have been used in artwork and decorative designs in jewelry and fashion. 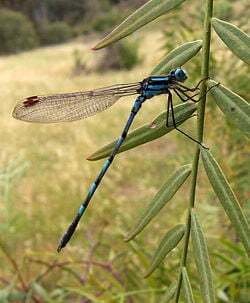 Even musical inspiration has been tied to invertebrates, such as Rimsky-Korsakov's "Flight of the Bumblebee" and Joseph Strauss' "Dragonfly" (Kellert 1993). Silkworms have been treasured for centuries for their production of silk. Of course, a number of arthropods also have harmful consequences for humans, whether as agricultural pests, with insects and mites attacking food crops and wood, or as vectors of disease and agents of poisonous stings and bites. Mosquitoes are involved in passing on malaria, yellow fever, and dengue fever, ticks transmit Lyme disease and Rocky Mountain spotted fever, lice spread typhus fever, and fleas have been linked to the bubonic plague. Arthropods have also served as religious symbols, such as the Egyptian scarab. In terms of ancient Rome and Greece, David Quammen notes that "This link with the spiritual realm was applied to both groups within the Lepidoptera, moths as well as butterflies. Both…were delicate enough to suggest a pure being, freed of the carnal envelope. Both were known to perform a magical metamorphosis" (Kellert 1993). Budd, G. E. 2001. Why are arthropods segmented? Evolution and Development 3(5):332–342. Kellert, S. 1993. Values and perceptions. Cultural Entomology Digest 1. Retrieved November 13, 2012. This page was last modified on 13 November 2012, at 15:19.